This post contains affiliate links. If you make a purchase after clicking a link, I may earn a commission. What a wonderful read! Norman Maclean is a gifted storyteller, and the written version surprised me with the humor he used to describe people and events, a talent I hope to develop. This is one instance I enjoyed both the book and the movie, which is not what I usually experience. A couple of years ago, I came across Robert Ludlum’s The Bourne Identity ebook on sale. I enjoy the Bourne movies and wondered what details the book could supply to fill out the story. While I did get more information, I also found the book moved slower than the movie, with much of it involving Bourne and Marie talking through things, trying to help Bourne regain his memory. I have to wonder how I would have felt about the book if I had read it prior to seeing the movie. Would my opinion of both been different? 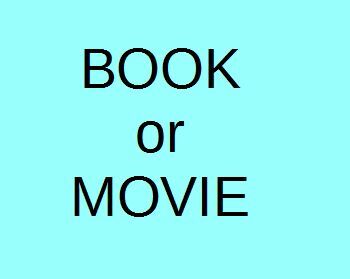 I read each book in the Harry Potter series before seeing the movie version of each. I loved the world created by J.K. Rowling in the books, and while I enjoyed seeing that world come to life in the movies, I also knew how much had been left out, how scenes had been shortened so the movies were kept to a reasonable length. I always left the movies wondering if people who had not read the books fully understood what was going on. So why bother watching the movie version? Because I am a visual person, and I love physically seeing the world created by an author. While it isn’t always what I had imagined in my mind, it still appeals to me to see how a story is portrayed in a film. If I read the book after I see the movie, I visualize the scenes based on what I saw in the movie. Yet, I will also continue to read the book that movies I enjoy were based on, to fill out the story, get details left out and understand the characters better. Do you prefer to read the book or watch the movie? If you do both, do you prefer to do one before the other? *The book is titled A River Runs Through It and Other Stories, which consists of 2 novellas and a short story. Subscribe to the monthly newsletter “Writings For Curious Minds” to get the latest stories, links to interesting articles and tips for writers here.